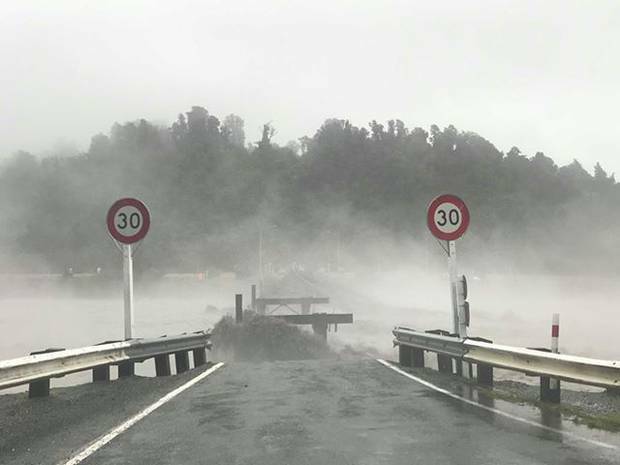 Waiho Bridge washes away amid flooding and heavy rainfall as state of emergency declared. A state of emergency was declared in Westland at 5.45pm following severe weather which has attacked the region since Sunday. Torrential rain and strong winds have battered the South Island region, forcing emergency services to close roads and evacuate members of the public. Earlier this evening, the Waiho Bridge was taken out by rising and rough floodwaters of the Waiho River near Franz Josef. The river is running at a level of 7.6m but has dropped back 0.7m from its peak. Elsewhere, the Haast River neared a high-level mark but levelled off at 7.6m. However, the Hokitika River continues to rise, sitting at 5m currently. Westland Mayor Bruce Smith told Newstalk ZB heavy rain was at the base of their problems but people remain the focus of the council and Civil Defence. Farmers on the south side of the Waiho River have already started to self-evacuate but the rising river was causing further headaches, Smith said. An Emergency Coordination Centre has been set up at the West Coast Regional Council in Greymouth. The ECC will further assess the need for a controlled evacuation on the south side of the Waiho River, the Westland District Council said in a statement. "There has been minor breaches from the Haast River into some properties, and accordingly a Welfare Centre has been opened in the Haast Hall," it reads. "Displaced persons are advised to go to the Welfare Centre in the Haast Hall for assistance." 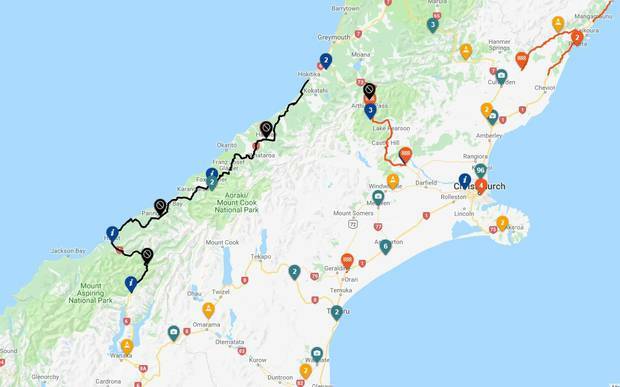 Road closures have been enforced on State Highway 56 between Hokitika and Makarora, with a slip at Douglas Falls in the Haast Pass. Ritchies Bus Services have also suspended all bus services tomorrow for the entire West Coast. Rainfall is expected to ease from South Westland from midnight, Civil Defence West Coast said. "As the front moves north heavy rain is expected to impact on river levels and roading networks," Civil Defence said in a statement. "River levels are currently being monitored throughout the region, with the Waiho and Hokitika Rivers currently elevated." Smith said heavy rain was expected to continue for another eight hours but it would ease before tomorrow morning. Following the loss of the Waiho Bridge, the entire Westland region's tourism industry would be impacted. "The loss of the Waiho Bridge is a real problem for tourism on the West Coast and for tourism in South Westland and Hokitika in particular," he said. The South Island's road network has taken a hammering due to the heavy rain and strong winds which have resulted in flooding and slips. NZ Transport Agency South Island asks motorists to take extra care with the extreme weather, debris and flooding impacting sections of road. State Highway 6 between Hokitika and Makarora is closed due to flooding and slips and will remain shut overnight. NZTA South Island said the next update on the roads can be expected at 8am tomorrow. MetService meteorologist Stephen Glassey said Milford Sound had already had more than 400mm of rain since Sunday. The heaviest falls were overnight, with 124mm in five hours from midnight, with rainfall rates of 30mm an hour over a few hours. Meanwhile, heavy rain continues to pelt the South Island this afternoon with emergency services remaining on standby. A number of roads and schools have been forced to close, with rivers throughout the West Coast running high, many reaching alarm levels. Haast has faced the brunt of the heavy rain, with over 70mm of rain falling today and 90mm expected by the end of the day. Er zijn nu 477 mensen aan het browsen op het forum. 2 Daarvan zijn ingelogd. Van die 477, lezen 7 mensen het topic "Wat was je heftigste onweer? ".